As the 'living room of the community', the public library is an ideal place for Manitoba's biggest book club! With generous funding from The Winnipeg Foundation and the enthusiastic participation of Manitoba libraries, bookstores and media, On The Same Page brings Manitobans together for a shared reading experience. Explore the book with our reader's guide. View photos of the book's illustrative displays at Millennium Library. 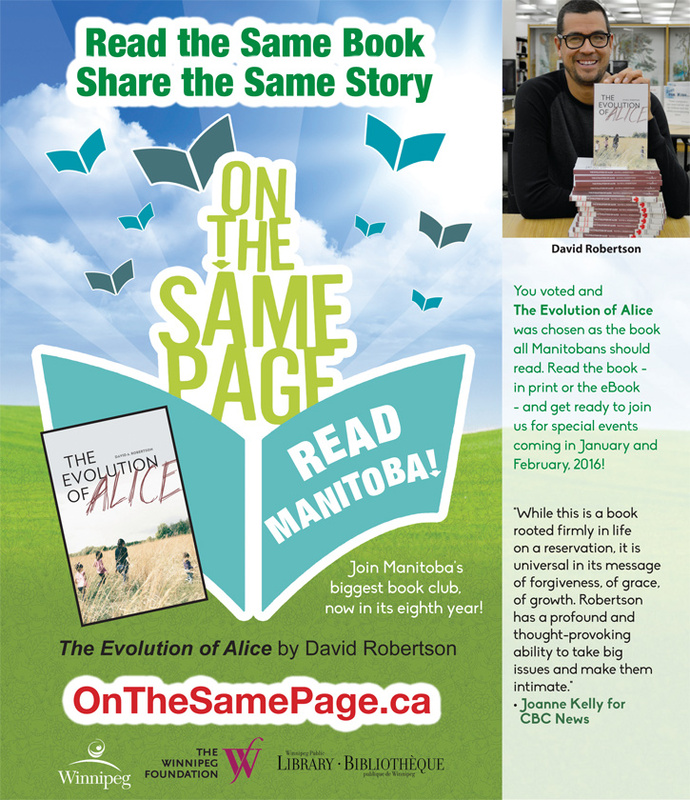 Winnipeg, MB – Manitobans have selected The Evolution of Alice by David Robertson as this year's featured book for the 8th annual On The Same Page, a province-wide reading initiative. The book is published by Portage & Main Press. "I'm thrilled and humbled that The Evolution of Alice has been voted as the book to get all Manitobans 'on the same page.' It's especially humbling considering the amazing books I was shortlisted with; I didn't expect this. I want to thank The Winnipeg Foundation and the Winnipeg Public Library for this honour, and I hope Manitoba enjoys reading The Evolution of Alice," said Robertson. "The public continues to select compelling reads for On The Same Page," said Rick Walker, Manager of Library Services. "David Robertson's book, The Evolution of Alice, is a heart wrenching story, but one that also offers the reader a message of forgiveness and hope. The societal issues that underlie the story will make for interesting programming that you will not want to miss." "On The Same Page is a great community-building project that gets people reading and talking about important issues in our community. The Evolution of Alice will certainly inspire some powerful conversation," says Richard Frost, CEO of The Winnipeg Foundation. Congratulations to Wanda M. and Andrea G. who each won a prize pack containing a set of the 4 short listed titles! 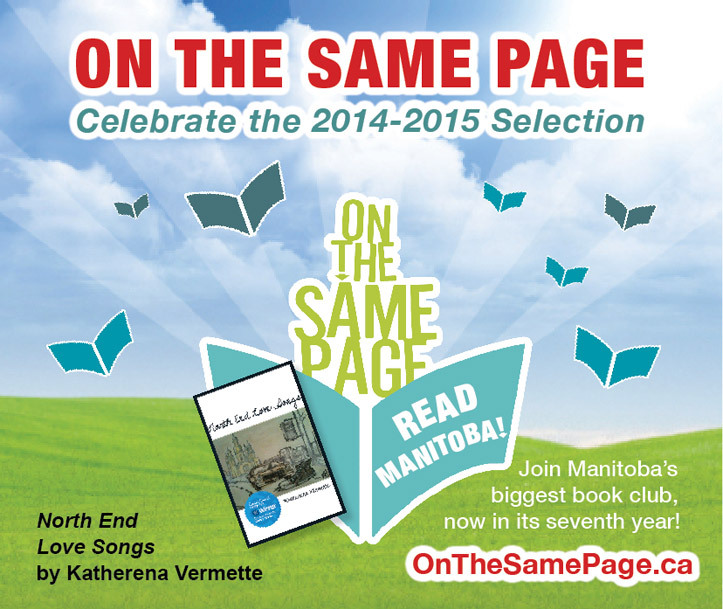 Manitoba readers have chosen North End Love Songs by Katherena Vermette as the book to read for On The Same Page 2014-2015! "In spare, minimalist language, North End Love Songs attends to the demands of Indigenous and European poetics, braiding an elegant journey that takes us from Winnipeg's North End out into the world. 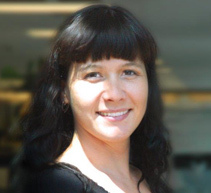 We enter the undocumented lives of its citizens and celebrate them through Katherena Vermette's beautiful poems." Check out North End Love Songs from the Library and join Manitoba's biggest book club! ....count yourself in on the Reader's Tally. Manitobans have selected Manitowapow: Aboriginal Writings from the Land of Water, edited by Niigaanwewidam James Sinclair & Warren Cariou, as this year's (2012 - 2013) featured book for On The Same Page, a province-wide reading initiative. 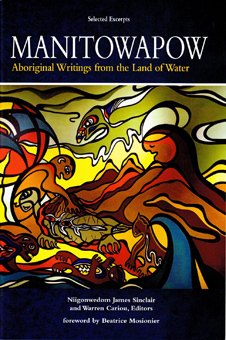 This 2011 anthology of Manitoba Aboriginal writings takes readers back through the millennia and forward to the present day, painting a dynamic picture of a territory interconnected through words, ideas, and experiences. 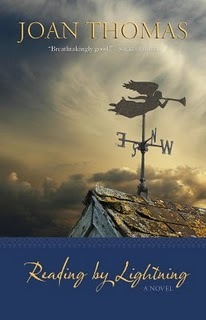 It is a rich collection of stories, poetry, nonfiction, and speeches. 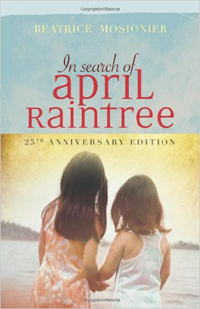 Beatrice Mosionier (left), author of In Search of April Raintree, the inaugural selection for the first year of On The Same Page. In this fifth year of the program, Beatrice's writing appears again in Manitowapow: Aboriginal Writings from the Land of Water. On April 11, 2013, Neechi Commons, 865 Main St., was the venue for the wrap up celebration of On The Same Page 2012-13. Many thanks to the editors, Niigaanwewidam James Sinclair and Warren Cariou, of this year's featured title. They engaged readers of all ages at events in Winnipeg and during a tour of Norway House and The Pas. Thanks also go to the many writers who contributed to the anthology, some of whom accompanied the editors at events to read from their work. 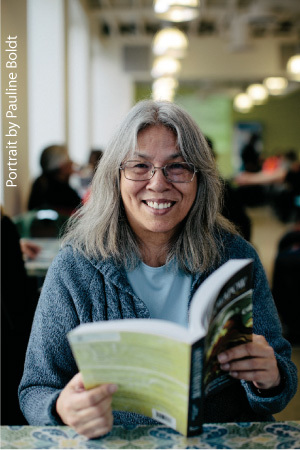 More than 800 free copies of the books were distributed to libraries across Manitoba, high schools in Winnipeg, First Nations schools across the province, and many other agencies and organizations. 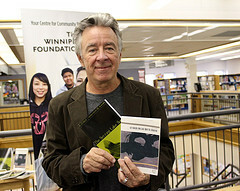 Manitobans have selected J. R. Léveillé's novel The Setting Lake Sun / Le soleil du lac qui se couche as this year's (2011 - 2012) featured book for On The Same Page, a province-wide reading initiative. 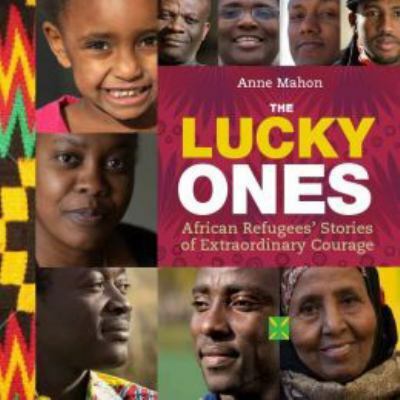 The book is published in French by Les Éditions du Blé and in English by Signature Editions. The Library also has eBooks in both languages: English / French. Click here to join the conversation and add your comments to the blog. Click here to see On The Same Page events held during January - February 2012. McNally Robinson Booksellers on September 7. 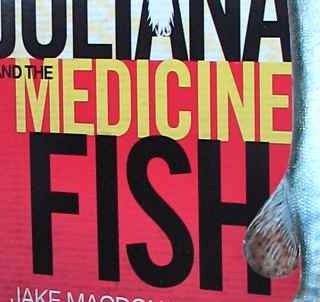 Manitobans have selected Jake MacDonald's novel Juliana and the Medicine Fish as this year's featured book for On the Same Page, a province-wide reading initiative. 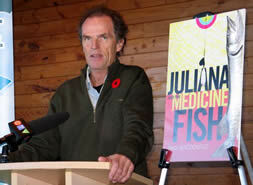 The announcement was made November 3, 2010 at a press conference at FortWhyte Alive. "It is an honour to be mysteriously plucked out of the hundreds of books that are produced now in this province, to be part of this event," says author Jake MacDonald. "Sometimes, stories, you feel like you have to make them up, sometimes you're just a delivery boy. With this story I really just felt like the story arrived on my plate fully formed and all I had to do was write it down. Maybe I was just a vehicle for this story and maybe that's one of the reasons it seems to work so well. Jake MacDonald is a Canadian author who lives in Winnipeg, Manitoba, and spends his summers in Minaki, Ontario. Over twenty-five years he has produced eight books of both fiction and non-fiction and several hundred stories for many of Canada's leading publications, including the Globe and Mail, Canadian Geographic, Maclean's, Cottage Life, Outdoor Canada, and The Walrus. He has won over two dozen awards for journalism and some of his books have been recognized with national awards as well. The memoir Houseboat Chronicles won three awards across the country, including the Writers Trust of Canada prize for best non-fiction book of 2002. This popular and poignant novel tells the story of 13 year-old Juliana Saunders, whose parents have separated. Juliana tries to help her dad win a fishing derby by catching an enormous and elusive fish. When they finally capture the fish she must decide what is more important, protecting the huge fish -- the last of a mythic species -- or saving her father's livelihood. Great Plains Publications Ltd. is an independent publisher based in Winnipeg, and committed to publishing the very best books from the Prairies -- a region they believe has an abundance of quality writers. Great Plains also publishes fiction from authors across the country in their imprints, Enfield & Wizenty and Great Plains Teen Fiction. Families were invited to catch Jake MacDonald along with Aboriginal storyteller Joe McLellan for an afternoon (January 9, 2011) of ice-fishing and fish tales at FortWhyte Alive. Sunny skies, sparkling snow, biting fish and lots of happy people made for a great winter experience in Winnipeg. Here are photos. On the Same Page displays are featured at Fort Garry Library and Millennium Library. Here are some photos. The On the Same Page 2010 - 11 program had their wind-up at Millennium Library on May 17, 2011. Here are some photos.